The musical Jesus Christ Superstar offers a retelling of well known biblical story of Jesus’ last few days in Jerusalem. 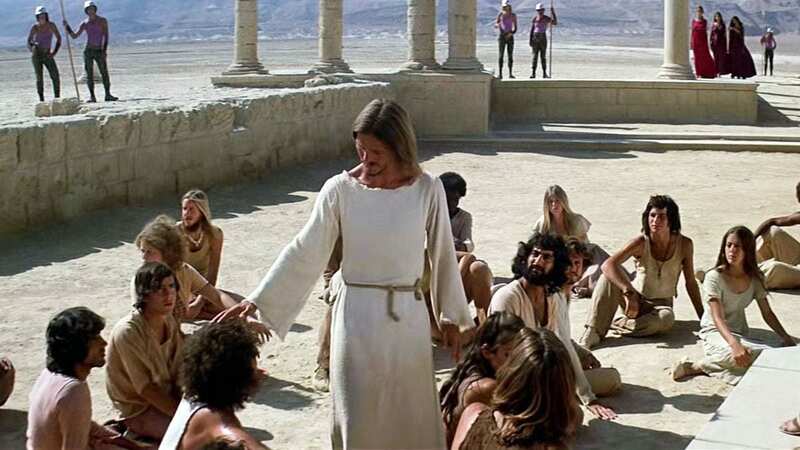 At the time of the original films release in 1973, Jesus Christ Superstar gave audiences of the time context for the ancient story. The biblical characters sport typical clothing and hairstyles worn in the 1970s and traditional gospel music is replaced with popular musical styles of the time. Not only does the physical appearance and sound of the show increased the ability of viewers to relate to the distant story, some characters, such as Mary Magdalene and Judas, are more developed than in the original telling and give the audience someone to connect with. The bible does not spend much time writing about Judas as an individual, mostly focusing on his role in the betrayal of Jesus that led to his execution. Judas is humanized in Jesus Christ Superstar by revealing his motives and emotions leading up to the death of Jesus. Judas explains the greater historical context surrounding the story of Jesus and exemplifies the emotions most likely felt by the average Jew at the time, allowing the audience to put themselves in the mindset of a first century Jew living in Roman occupied Israel. 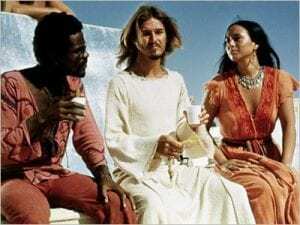 Although the majority of what is known today about the life of Jesus comes from the stories relayed by his apostles, his disciples fade more into the background in Jesus Christ Superstar, bringing Judas to the foreground as the voice of earthly reason. With the exception of Mary Magdalene, not much of a distinction is made between Jesus’ different disciples. They are never shown alone and mostly sing in unison, never challenging the direction Jesus is leading. They seem to be caught up in the teachings of Jesus, losing sight of their surroundings and focusing on the heavenly future Jesus has been promising. In the aptly named “Heaven on Their Minds”, Judas refers to the followers as blind and explains “I am frightened by the crowd./ For we are getting much too loud./ And they’ll crush us if we go too far”. In the eyes of Judas, the disciplines are mindlessly following Jesus without acknowledging that the more their movement progresses and grows, the more dangerous it is becoming. forced into slavery.The Roman Empire was generally tolerant of the different cultures of those living under their control. As long as they recognized the power of Rome and acknowledged the Roman emperor as a god, occupied peoples were permitted to continue practicing their own religious traditions. Although the people of Judea were able to practice Judaism, there was still a limit to the tolerance exhibited by the Romans. They were not hesitant to take action against movements that could be viewed as a threat to their authority. The Romans had plenty of resources to suppress any perceived threats, a fact that would have been well known by all who live within the empire, including Judas, who reminds Jesus and his followers of this throughout the play. Judas continually expresses and is motivated by the idea that the attention Jesus is getting will negatively affect the greater Jewish community. Compared to the lives of their ancestors who had been exiled and enslaved, the Jewish people had a relatively good life under the Roman Empire. They had been free to practice their religion while living in their promised land, two important aspects of life for the Jews that Judas did not want to see stripped away. Only a couple of decades earlier in 4 BCE, the Roman government had burned the outer part of the temple, which would have been a known event by Jews at the time of Jesus (Bond 65). The Second Temple of Jerusalem was considered an extremely holy place with only the high priests capable of entering center parts of the temple. The Temple was the main pillar for the Jewish community and it would have been a common sentiment amongst the people to possess the desire to protect it at all costs. It is the threat of destroying their holy Temple and an end to their ability to practice Judaism in their everyday lives that motivated Judas to betray his friend, a threat that he was right to worry about. Only forty years after Jesus’ crucifixion, the Second Temple was destroyed by the Romans in response to a Jewish uprising, demonstrating that Judas was not just paranoid and his warnings could have easily come true. Knowing the very real reality that his race was at risk is what drove Judas to assist in the arrest of Jesus, despite his own admiration and love for him. When reading the biblical text, Judas is painted as a villain with no attempt to explain why he would betray Jesus. By finally giving him a voice, Judas is brought to life in Jesus Christ Superstar. The audience is able to form a connection to Judas by telling his perspective, especially through singing which is more emotionally charged. 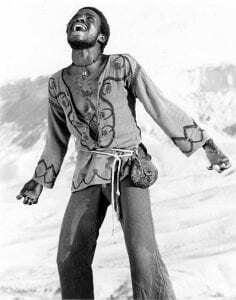 From the very first number, the viewer always knows how Judas is feeling, even when he is confused himself like in the song “Judas’ Death”. Sung after Jesus has been arrested and whipped, the song changes tone multiple times to reflect the inner struggle of Judas trying to reconcile his love for Jesus and his own actions against him. It is natural for any listener to sympathize with Judas when hearing him express the raw emotions that drove him to take his own life. Feeling connected to one of the most famous antagonists in history forces the viewer to rethink the story of Jesus they thought they knew and reconsider how they would behave if put into the shoes of a first century Jew in Israel. Westminster John Knox Press, 2004. Christ Superstar,” Journal of Religion & Film: Vol. 3 : Iss. 2 , Article 2.